These easy broccoli fritters are made with cheddar cheese and have a hearty toothsome bite! A minimum of ingredients keeps this recipe healthy and low carb too. I recently visited my family in Texas and wowed my sister-in-law with broccoli fritters for breakfast. I simply used leftover broccoli from dinner the night before. But let’s get real… No one’s excited about eating leftover vegetables… BUT A FRITTER? That’s exciting! Trying to get kids (and some adults) to eat vegetables sometimes calls for new or imaginative ways to present them. For the most part my family loves vegetables but we can become tired of eating our favorites, like broccoli, the same way every week. Enter the fritter! Broccoli fritters are my new veggie obsession. I typically make zucchini fritters in the Summer to help use the bounty we receive from neighbors. 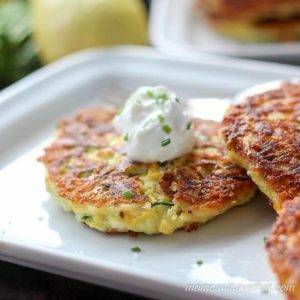 And my husband swears that cauliflower fritters make the best low carb hash brown substitute around. But there’s something about the toothsome bite of these broccoli fritters that has me making them every week. If you’ve never made vegetable fritters, you’ll love how easy they are to make. Typically, vegetable fritters are made with chopped, mashed, or grated vegetables mixed with a batter then fried in a pan. They’re often formed into patties or pancakes, shaped into logs or croqeuttes, or rolled into balls and deep fried. Common binding ingredients for fritters are flour, eggs, and cheese, but gluten-free flours like chickpea or almond flour are common replacements in gluten-free and low carb recipes. Since this is a low carb recipe, you’ll see that I use an alternative flour as well as lightly steamed fresh cut broccoli, eggs, and cheddar cheese. If you are don’t follow a low carb diet, feel free to use all purpose flour. The recipe is forgiving and using leftover broccoli from a previous meal works well, too. As you can see from the photos, I like to keep my broccoli pieces a little bigger. It appeals to me visually and I enjoy the crunch of the bigger pieces. I steam mine after cutting. BUT, if you like your broccoli in smaller pieces, steam first and then chop. I prefer pre-grated cheese and the finer the grate the better, but freshly grated cheese works well, too (as seen in the photos). 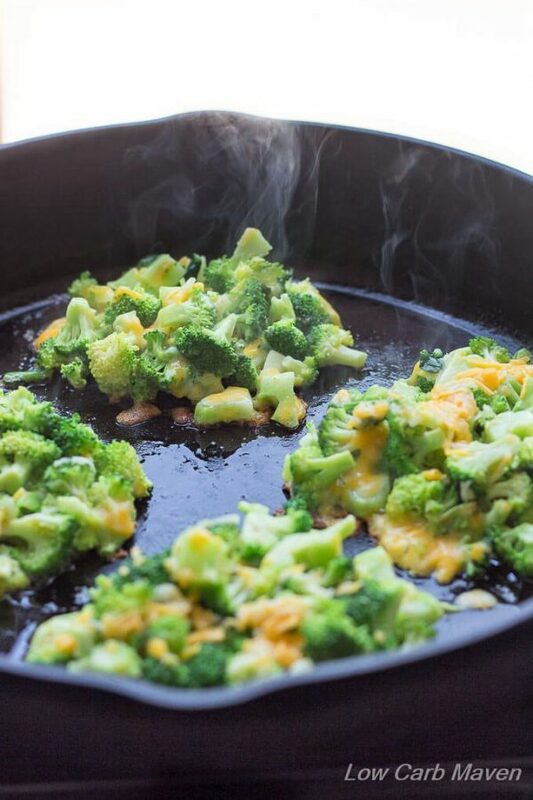 Broccoli Fritters With Cheddar Cheese are 2.8 net carbs per large fritter. Toss or stir the broccoli with your flour of choice and the Cajun seasoning to coat. Add the egg and stir. Add the cheddar cheese and stir until thoroughly combined. Place a cast iron or non-stick pan over medium heat until hot. Add the oil and swirl to coat the pan. A non stick pan needs less oil. Visually divide the mixture into fourths and spoon into the pan, arranging in a low mound or patty. Scrape any tumbled pieces back into the piles. Cook on one side until the cheese on the top of the patty begins to melt and the bottom is crusty brown, about 2-3 minutes. Flip and cook on the other side until browned. Makes 4 large patties, 2.8 NC each. Serve topped with an egg or with a dipping sauce. [NOTE] Use a 1/4 cup measure for smaller broccoli fritters. I was able to get 9 fritters which made a nice afternoon snack for my family. SAUCE: I Googled "remoulade sauce" and found many easy tasty recipes available. I used one of them. Can I use broccoli slaw? Is there a dressing recipe it looks good too! Would it be possible to adjust it to no egg or only one egg with a different binder? I am very sensitive to egg taste and they tasted of omelettes to me. I loved the idea, though! Hi. I was wondering what a serving size is for this? Carbs are up at 5 and is that per fritter? I added a little sautéed onion to the mix. And Fritters (of any kind) always get a dollop of sour cream…in my house! I made these tonight. When I first pot it in the pan I didn’t think it was going to work. But it did and it’s absolutely delicious. I didn’t have Cajun seasoning so I used a little seasoned salt (Lawry’s). Did not need any sauce. Thank you for posting! I made these last year and forgot about them. Just made them today and they are so easy and delicious! Could II use frozen chopped broccoli? I used broccoli florets in the steam-in bag from Walmart, steamed 5 minutes in microwave, chopped to bite-size, dried a little with paper towels. I LOVE THIS! What can be used in place of eggs? I just made these and they were yum!! I added some ham to mine. I formed the patty shape with some silicone egg rings which meant I could pack the mixture together a bit easier. Thanks for a great recipe Kim, I’ll definitely use it again. Thanks for the recipe / ideas!!! While low-carbing it, I’ve eaten a number of egg-cheese-broccoli dishes – this was a very welcome change. Although i didn’t “follow” the recipe, I can tell it is great. I had about 2/3 cup cooked, chopped broccoli in the fridge, so I added an egg, some cooked onions (also from the fridge), shredded x-sharp cheddar, a couple of spoons of almond flour, and some seasoning, and cooked in oil. The remoulade sauce was a brilliant suggestion – eating them even reminded me of eating seafood fritters with remoulade, because of the nice texture of my large-ish broccoli pieces. Well, I’ll make this again, for sure! mom and i are doing the keto diet. 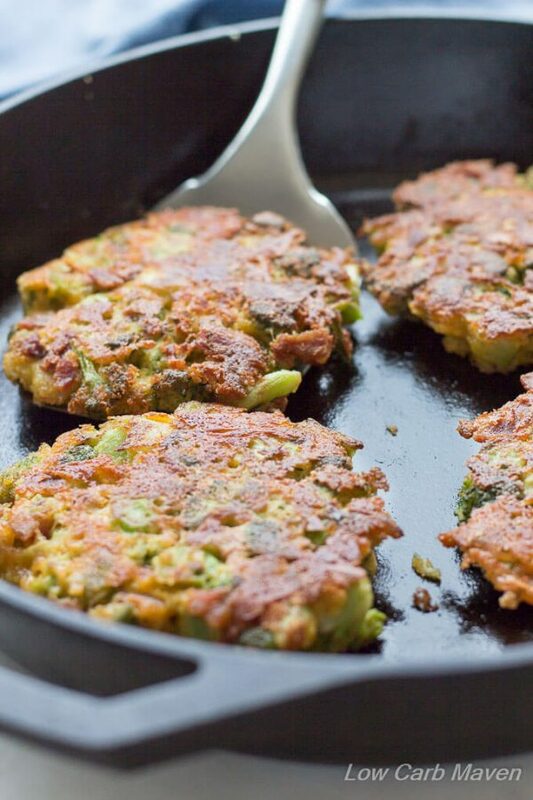 going to try the broccoli fritters tonight w/bacon@eggs on the side.will reply back w/results. What dipping sauce did you prepare? Really yummy and they reheated well too. Definitely going to make these again! Do you think this would work with egg beaters instead of eggs? Delicious! I made these but I only had coconut flour so I used half the required flour since that’s how you replace almond flour with coconut flour…next time I think I’ll salt the broccoli a little..so delicious! Just made these today and they were EXCELLENT! My dad is diabetic and not a big vegetable eater and he devoured them. Win win! I used Old Bay for the seasoning, yum! Thank you! I made a variant of these, added chopped chicken and jalapeños. Delish! I baked the broccoli instead of steaming for extra flavor and then baked the fritters instead of frying. They turned out great. Thanks for the delicious recipe! The baking sounds like a great idea. At what temperature and for how long did you bake these fritters? I am beyond excited to try these tonight! I have some Almond Flour I need to use up, and was wondering what I could use the amount left in, Voila, I find this recipe, wish me luck, lol! These were absolutely fantastic! They’re a new household favorite! These were sooo good! Fairly easy to make and even my 2 year old liked them! Will be making this recipe again. Thank You. Awesome! Thank you! 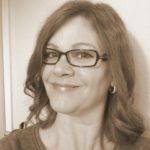 I have been following a lower carb eating lifestyle style for almost three months. 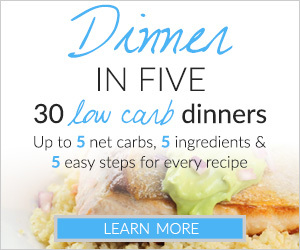 I am looking for new ways to “spruce up” some of my favorite low carb veggies. 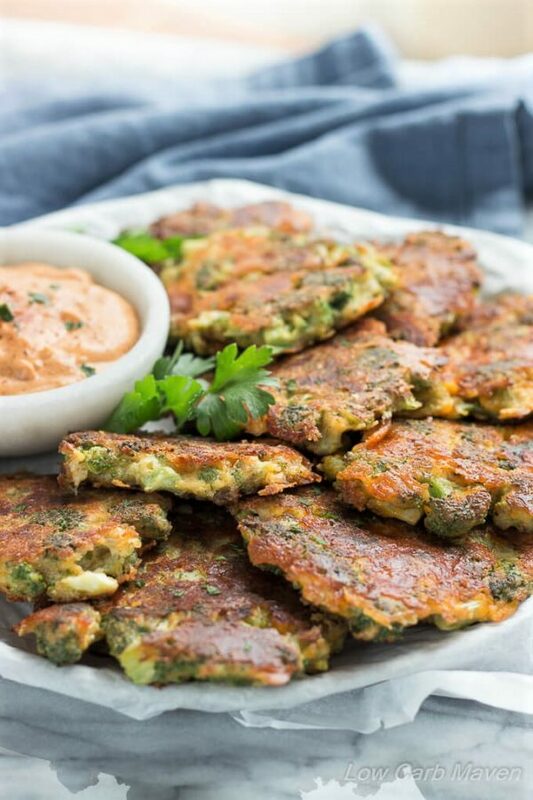 These broccoli fritters are a big hit in my house! I did put my fresh broccoli in a food chopper and made smaller pieces…it was just perfect for our taste! They taste awesome paired with an avacodo/guacamole type dip! 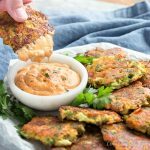 The possibilities are endless with these fritters…you could try different veggies, different cheeses and spices! Thanks again for the recipe, it’s a keeper! I tried this recipe 3 times but my stick every time which makes it all fall apart. I can’t get a crisp on the outside because it just sticks to the pan. I tried a nonstick skillet with spam olive oil spray then tried olive oil. Both had the same result. I’m super bummed. Any suggestions? I don’t own a cast iron skillet. PS even the broccoli cheese egg mixture mess I end up with as an end result is delicious. I just long for that fritter crispy crust. I agree with having used cast iron and a nice amount of bacon grease. It was totally fritter. I made these last night. They were a big hit! Thanks for the recipe; delicious! I love your recipes especially if your beggining to be healthier and that kinda stuff love your recipes!! These look delicious!! Wanting to make them for my 3 year old….but I’m wondering, have you ever tried to freeze these? Think they will freeze well to reheat later? Made recipe exactly and it was perfect. Local store had Brussels sprouts on sale for 77¢/lb. so I put a little over two pounds of them in the food processor, chopped them up into medium pieces, and microwaved for eight minutes. Added 3tbs of ground up pork rinds, 5tbs almond flour, onion & garlic powder, salt, pepper, chili powder, and four cups grated monterrey jack/colby. Patties wouldn’t form with four eggs so I added another two. I had to make these as soon as I saw this picture. I added some parmesan cheese and a little dehydrated onion flakes. They came out amazing !!! I topped them with my homemade ranch dip. Definitely will be a favorite. These are really good! I used 3 big heads of fresh broccoli, and added an extra egg. I used almond flour, but next time I’m going to try Mission picante flavored pork rinds. I finished them off with some sprinkled cheese and drizzled ranch! Gonna try cauliflower next! These were fantastic and really easy to make. Even my meat and potatoes husband raved about them! These will definitely be a staple in our house. Twice I have followed this recipe. Came out great both time. Family jumped on them like pigs at the slop trough. Ok these are seriously delicious! I used ground spicy pork rinds instead of the flour and omitted the Cajun seasoning and these were as good as burgers! I would totally serve these at a low carb lunch. Thanks for the recipe, I’ll be making these often! I made these last night and they were a huge hit. Broccoli is hard to get creative with, but this recipe is a keeper. I used more almond flour to make it more pancake like. Do you have a recipe for the cheese dip? My family LOVES these! And tonight my husband substituted cauliflower instead. Reminds me of potato pancakes from pre low carb days!! A definite keeper!!! You lost all credibility with me when I saw the photograph (and it’s in the video too), of you using a metal spatula in a non-stick pan. Jeez, no need to be such a negative Nancy. That was only factual and politely explained. I’ve just made my 3rd batch of these. They are so tasty! I mix up the spicing each time – next time I’ll add curry. I fry them in bacon grease, which gives them even more flavour. One large egg seems to do fine for me…I had a discussion with a dual US/Canadian citizen who said your large eggs are smaller than ours. These were quite good! I added 1/4 onions and served these on sprouted bread topped w/sriracha mayo and a tomato. This recipe is so versatile and easy. When I first fried them I had to keep myself from just dipping them and eating, and then I made open face tuna melts on them. Then I crisped the leftovers up in the oven the morning after and used them in place of an English muffin for a low-carb eggs Benedict. I was wondering how long these will last in a fridge? 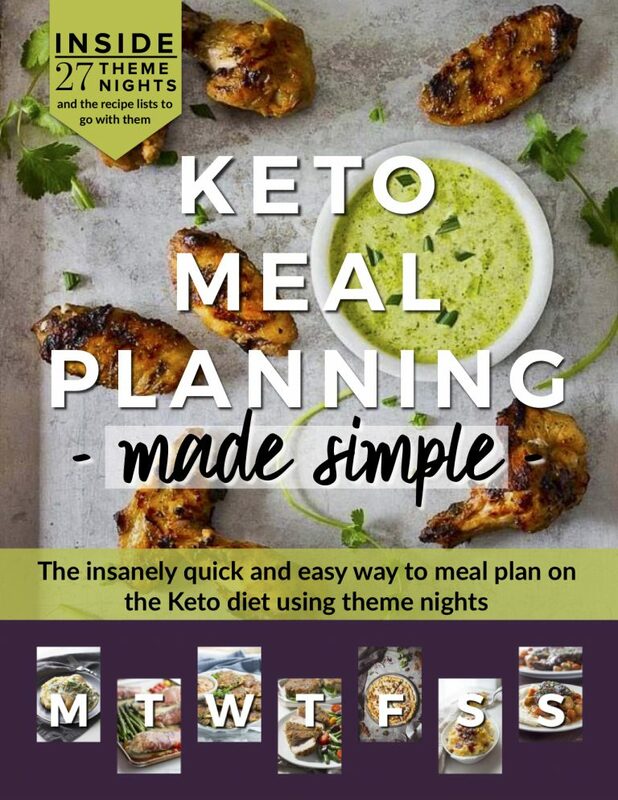 I am a solo Keto eater and if I make them I would like to be able to eat them on multiple days. hi! what a great recipe. are the nutrition facts for 1 critter or 4? thank you! Would coconut flour work OK instead of almond flour? I found this recipe on my kidney stone prevention site. Kidney stoners have to stay away from almond flour so I subbed it with oat bran and they were delicious! I’ve made them for breakfast the last 2 mornings. I used jalopeno montery Jack cheese which along with the cajun spice gave it an amazing flavour and fried the fritters in coconut oil. Thanks so much for this amazing recipe! What kind of sauce do you use? I want to try. These are delicious. That coming from a non veggie eater. Even better the recipe is easy and quick. Will definitely make many more times. 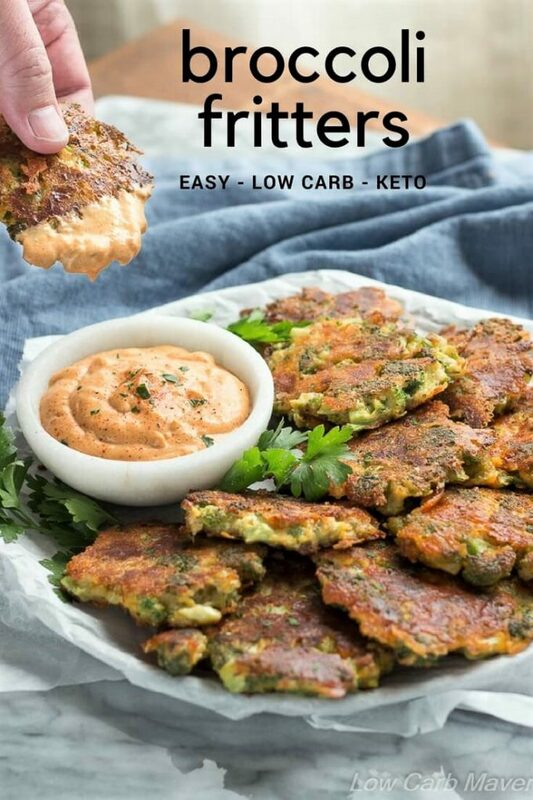 I LOVE fritters of all kinds and these did not disappoint! I’m eating them right now with a yogurt sauce (plain high fat greek yogurt, garlic & onion powders, salt, pepper, parsley and a little lemon juice) boy are they tasty! Thanks! This is fantastic. I halved the recipe and got two good-sized fritters. I mixed up some mayo and Dijon mustard as the dipping sauce. I’ll be making this a lot! Thanks so much! I made these last night and my SO and I both loved them! We made them instead of the traditional grilled cheese sandwiches to go with some homemade tomato soup. It was a great way to work some extra veggies and still get that ooey gooey cheeseiness. FYI, I used frozen steamable broccoli, the kind where you can throw the bag into the microwave for about 5 minutes. I cut the larger pieces into smaller pieces and used paper towels to get some extra moisture out of the steamed broccoli. Otherwise I followed the instructions exactly. 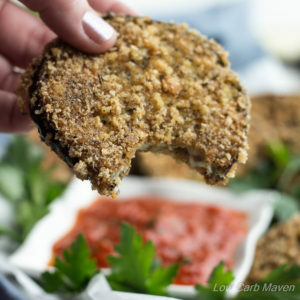 We’ll definitely be making these again and it seems like the kind of recipe that can be tweaked with different veggies and cheeses, I’m so excited I found this recipe! Thank you! What are you using as the side dip for the broccoli fritters? Can frozen/dehydrated and rehydrated broccoli be used, if drained well, instead of fresh? The garden is producing tons of broccoli now – far more than we can eat fresh, and this recipe looks like a keeper! I don’t know what I did wrong but they just fell apart when I tried to flip them. Maybe I added too much oil? I forgot to beat the eggs so maybe it was that? They smelled sooooo good! I will try again another day. The solution for all of my least favorite veggies: put em in a fritter! :) I’ve gotta say it, these look amazing!! Hello – I made these tonight – they were nowhere near as pretty as yours but they tasted really good and I would make them again. I did add some dried chopped onion because I love onions and add them to almost everything I cook. I might add a dash of Worcestershire sauce next time (I have an English hubby), but he liked them just as I cooked them this time. I halved the recipe since there are just the two of us, but in a different post you said I can freeze them so maybe next time I’ll make some more. I’m looking forward to the cauliflower fritters soon! These fritters were delish! I made half the recipe for 2 large fritters. I had them with a Greek yoghurt based cucumber ranch dressing to dip and some leftover fish from last night’s meal. Filling, easy and yummy. Looks yummy, Kim! 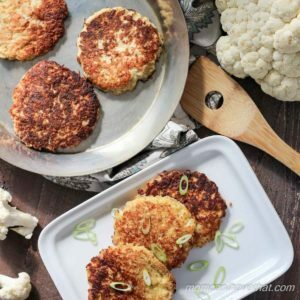 I love your cauliflower and zucchini fritters, so will definitely have to try these! Trader Joe’s now Carrie’s riced broccoli, too,which should work well! Quick question, is the nutritional chart based on 4 servings or on the smaller 9 servings? I love learning new ways of making old fashion recipes. Can’t wait to make these and that dipping sauce in the photo looks delicious! Can you possibly point me to your recipe? Thanks! I’ve just made these, they turned out well! My fitness pal calculates the recipe as 4g net carbs per patty, so 16g in total. 8oz of broccoli (according to google) has 16g of net carbs, is this correct? 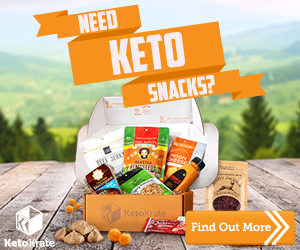 When I saw the 1g net carb per party I got all excited but alas it doesn’t seem right.